This DVD combo pack presents a riot of padams and javalis by composers across India belonging to diffrent regions and periods. 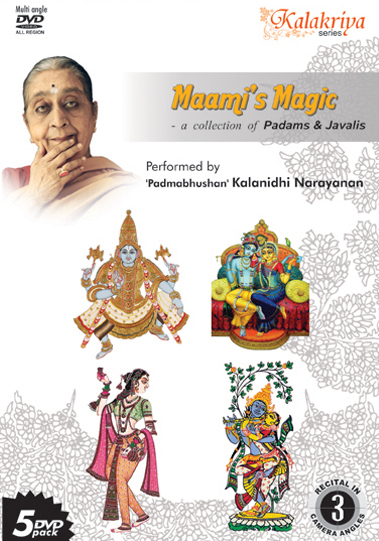 Handpicked and demonstrated by 'Padmabhushan Smt.Kalanidhi Narayanan ('Maami - to her students) ,the legendary abhinaya exponenet,they proclaim the sparkling diversity of Indian forms. She takes us an aesthetic voyage to explore a myriad characters ,object and emotions. She does it all with a tilt of her head and turn of her eyes backed by the hands that fold and unfold in various shapes and styles.It is a unique language:a magic conjured up a medley of meaningful Lyrics,,mellifluous music and a matchless artiste described by natyashastras as 'abhinaya'.